We greet a new decade with a clearer knowledge of limits, a richer sense of community, and a deeper understanding of what it means to chart a personal journey towards resiliency and a reduced carbon footprint. While we are cautioned by Sharon Astyk to practice losing, we can be truly heartened by all those stepping up to adventure with us and the impressive new tools they bring. Sustainable NE Seattle has developed a discussion guide for groups studying the Transition Handbook. Transition Santa Cruz has thoughtful tip sheet on going door-to-door and engaging your neighbors and Ben Zolno has a new video on Why Transition. Around the world communities are rising to the challenge. Transition Network co-founders Peter Lipman and Ben Brangwyn in conversation with Vicki Robin will discuss what is happening in the Transition Movement in the UK and in other countries around the world. Add your questions when you register for this free event scheduled for Wednesday, January 27th at 10 am PST. On the news front, Transition Initiatives have been seen in: Yes Magazine, Huffington Post, and other local papers like the Pasa Robles Press. Continue to send us stories of your journey in unleashing the brilliance, compassion and resourcefulness within your communities. Let us know how we can help you. 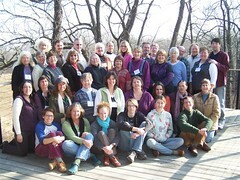 Photo: Training for Transition in Hastings, MI on November 20-22, 2009. Peter Lipman and Ben Brangwyn, co-founders of Transition Network with Rob Hopkins, will talk about - and answer questions about - transition's current developments, opportunities and issues from both a UK and global perspective...In addition, they'll look at the social, political and ecological angles of our current predicaments and talk about specific groups, activities and projects that are rising to the challenge. Based on Sandpoint's experience, this webinar will share some of the essential components of putting your event together: how you know you are ready, building the buzz, creating an event that reflects your vision, leveraging your community connections, having fun, and following up (what is next?). For Transition to be successful there needs to be an unprecedented coming together of the broad diversity of society. This workshop will focus on helping Transition Initiatives to achieve this. Transition Trainer, Bill Aal will facilitate an interactive session which will help participants explore the principles of diversity, inclusion and openness and overcoming ‘us and them’ thinking. See the online trainings archive for recordings of past webinars and our newly enabled on-line forums to continue discussions. Sustainable NE Seattle has developed a six-week discussion course based on The Transition Handbook, and is now making the course available to other Transition Initiatives who want to offer it to their own members. Transition Santa Cruz has put together resources on neighbourhood community building including specific ideas that you can do on your block and a tip sheet for going door-to-door. Visit the link above for more information on getting started. Transition Times is an evolving global/local news source that is reporting on humanity’s response to the extraordinary global challenges and opportunities that we face and the story of the emergence of the culture of Transition on this planet. This new version includes several video segments with Rob Hopkins and information on climate change and peak oil. Transition Initiatives across the country are leveraging the A.T.D. Symposium as tool for building community awareness. Contact us for more info. This video offers some examples of Calgary initiatives that support the Transition Town movement. Selected from the Hillhurst-Sunnyside Community, this video shows complementary currency, cooperative housing, urban orchards, carsharing, and cultural events. Ben Zolno put together a video that outlines the energy uncertainty imperative of "Why Transition", highlighting some of the ways communities are working to relocalize and increase their resiliency including addressing food, energy, transportation, local business and more. T ransition Town Manchester asked the Manchester, Vermont community to look ahead to the year 2020 and tell them what they would like to see for a sustainable future. This delightful video captures their visions of what they want to see in their community. People all over the country are choosing to move their money out of large banks and into smaller, community-oriented financial institutions and this new online resource allows you to search for your local financial institutions and learn more about your banking options to reduce risk. Transition Trainers Rebecca and Bill Wilson have put together "The Case for Permaculture," a free 18-Part 'YouTube' Video Series that lays out the global context for using permaculture design principles, drawing from webinars that they have delivered in the past. Authors Paul Edwards and Sarah Edwards (also a Transition Trainer) ask, how do we financially support ourselves while moving towards sustainable lives? They consider dozens of possible careers and and practical life choices for navigating a changing economy. For more episodes, see also Peak Moment TV highlights from 2009. Spread the word: forward this newsletter to a friend. Get started: Review the resources, online training archives, hold an informational meeting in your home, show a video, organize a Transition Salon (what is a Transition Salon? ), form a group that is “Mulling” it over…start a Transition Initiative. Stories: We want to collect, chronicle and share your stories on our website to inspire and educate others. Some of these may end up in Richard Heinberg’s new book. Send to: stories@transitionus​.org. Follow Transition US on twitter, facebook, WiserEarth, flickr and youtube and invite your friends!